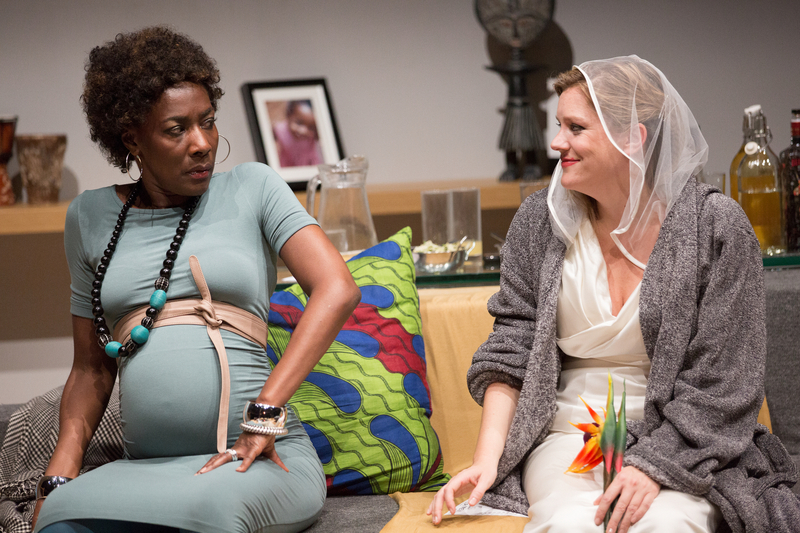 “That is what tonight is about”, exclaims one of Sarah Rutherford’s white mothers – the play approaching its halfway point. Unless you’ve been asleep you’ll know she’s talking about race. If you’re anything like me, you’ll already be suffering from mild concussion at being repeatedly slapped about the chops with the subject. The action takes place in a swanky London ‘media room’ on the eve of Obama’s election in 2008. Pursed-lipped and sanctimonious, Natasha plays hostess to three other mothers in an evening devised to diversify the racial portfolio of her children’s friends. Mo and Angela are both one half of mixed race couples and “Aryan” Izzy’s only there as moral support – and because she’s known Natasha for years. 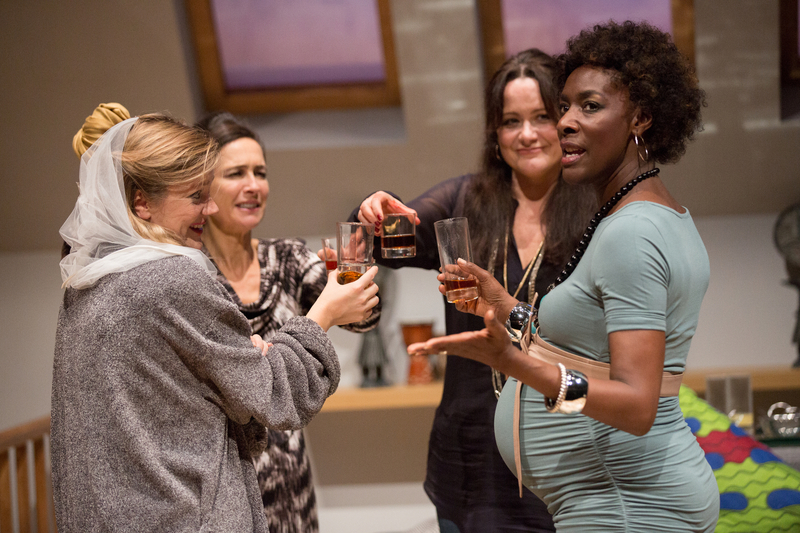 The four women turn to Truth or Dare and lethal ‘Obamatinis’ in a desperate bid to break the ice. Meanwhile their absent children and men begin to drive the action from civilised small talk to knife-wielding hysteria. As etiquette breaks down, there are fantastic moments of farce. Angela, her vast pregnant belly and a medicinal cocktail bouncing regally together on Natasha’s exercise ball; Izzy’s entrance in full wedding regalia, bare bottom exposed; the unravelling of Natasha’s perfectly coiffed hair as she well and truly loses her composure. This cast certainly nails comic timing, riffing off each other in a virtuous (and at times vicious) cycle of energy. 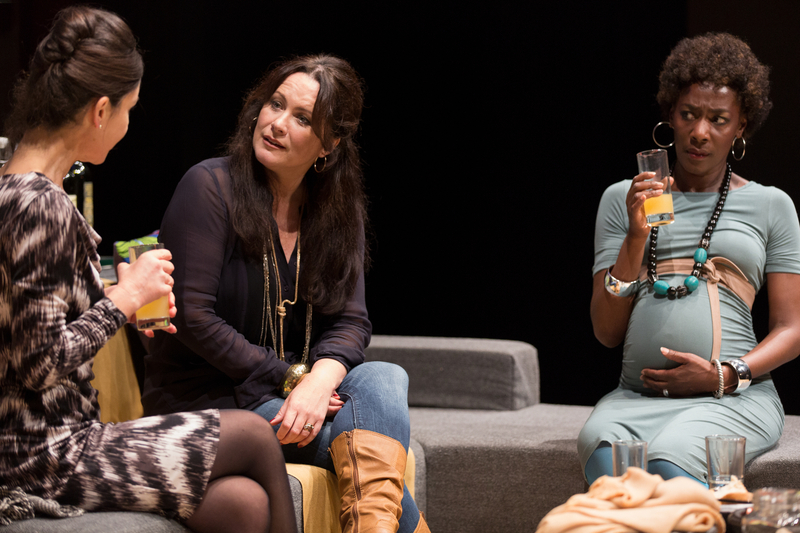 Susannah Doyle imbues the uptight Natasha with a touch of camp, while Olivia Poulet manages to move her naïve subservient Izzy away from the girlishness of her first appearance. Amy Robbins, as the initially most likeable Mo, and Jacqueline Boatswain, as the unflappable Angela, arguably have the harder parts to play. They cope brilliantly, steering away from easy stereotypes and allowing the comedy of their characters to build gradually as their contradictions are exposed. Race issues may be rammed down the audience’s throat and some of the points laboured (Angela feels it necessary to repeat and clarify the obvious post-colonial overtones of Natasha making her Ethiopian children “earn” back everything they’re given by their white parents), but on the whole the subject is handled with sophistication and modernity. The conversation in which Angela and Mo indirectly ask Natasha why she chose to adopt black babies rather than “white trash” raises a difficult issue little confronted in the tabloid press, where Madonna and ‘Brangelina’ are feted as “the saviours of poor little black kids” without regard for the power structure this suggests. Much has been made new playwright Sarah Rutherford’s originality in Adult Supervision. But as the action unfolded I couldn’t shift the sense of déjà vu. 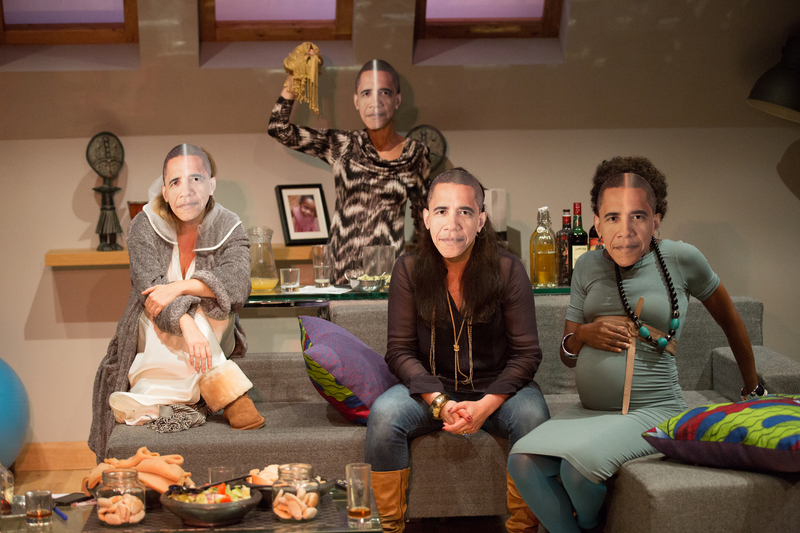 Déjà vu the U.S. election night setting – Christopher Shinn’s Now or Later (Royal Court, 2008). Déjà vu the disintegration of social niceties when four parents are confined for an evening in a smart city apartment with access to booze and nothing to talk about but their kids – Yasmina Reza’s God of Carnage (Gielgud Theatre, 2008). And déjà vu race talk – Bruce Norris’ Clybourne Park (Royal Court, 2010) and David Mamet’s Race (Hampstead Theatre, 2013). Perhaps Rutherford could have made more out of gender with her all-female cast? 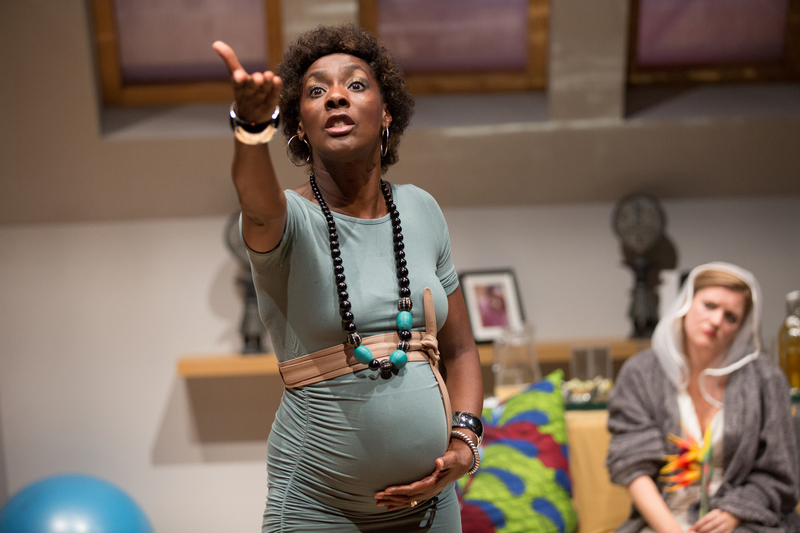 She touches on notions of motherhood, but ironically some of the most powerful characters in the play are the husbands, boyfriends and sons we never see. None of that seemed to bother the guffawing audience. The Park’s founder and artistic director Jez Bond has every right to a smug smile. While Adult Supervision may pander to the self-indulgent navel gazing of the urbane liberal middle classes, its astuteness makes that mild concussion well worth it.